Maersk group towage subsidiary Svitzer held a ceremony on the River Thames today to officially christened Svitzer Meridian as the latest — and tenth — vessel in its Port of London fleet. The 70 tonnes bollard pull Azimuth Tractor Drive (ATD) tug was built by Turkey’s Sanmar Shipyards. 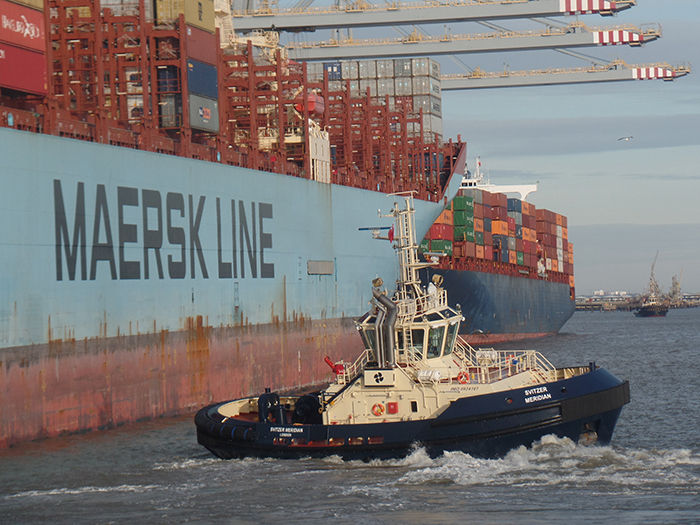 “Recently, we have seen a significant increase in activity and volumes in the Port of London, making it one of our busiest operations in Europe,” said Kasper Friis Nilaus, Managing Director, Europe, Svitzer. “Our team in London has capitalised on Svitzer’s global size and scale by quickly matching changing market demands and by utilizing the flexibility of our fleet in neighboring ports or on the continent. Moving assets between ports is a huge advantage”, he added. Vimal Choy, Sanmar’s Director, Key Accounts and Client Services Europe noted that the tug is the 21st tug built by Sanmar for Svitzer with another five under construction in Turkey. Exclusively designed for Sanmar by Robert Allan Ltd, Svitzer Meridian is a member of a new series of tractor tugs. The main difference between the tractor and other types of tug is the location of the propulsors. This new series has forward mounted Z-drives, while aft is a fixed skeg.